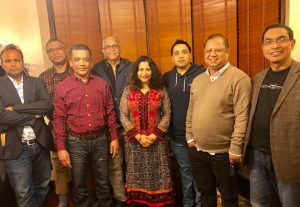 The Campaign for the Protection of Religious Minorities in Bangladesh (CPRMB) elected its new executive committee for 2018/19 with the following as advisors Mihir Sarkarand Pushpita Gupta. Those elected to the executive were President Devashish Das, Vice President Sujit Sen, Vice President Adhir Das, General Secretary Ajit Saha, Treasurer Kamol Saha and Media & Publicity Swapan Peris. The new team discussed various issues related to minorities and expressed their deep concern about the safety of minorities in Bangladesh in the context of forthcoming general election. They agreed that the concern will be discussed and raised by CPRMB in the forthcoming all party meeting at the European Parliament. There will also be an awareness seminar in August 2018 at the UK House of Parliament where few MPs, MEPs, councilors, local leaders and human right activists have already confirmed their attendance.